If you didn’t do it this fall, how do you get leaves off of your pool cover? 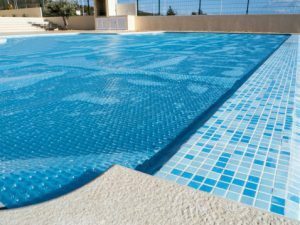 Once the summer and fall end, you’re faced with the sad task of closing down your pool for the winter season. After that, it may seem like you’re done with pool maintenance until the next spring when you reopen. If you have an above ground pool or a solid cover on your in-ground pool, that’s not the case, however. All those beautiful fall leaves that colored the autumn landscape have fallen from the trees, and it feels like every last one of them made it onto your cover. Couple that with the many autumn and winter rainstorms we had, your cover is probably a soggy mess. So now you have to clean it before the next hard freeze. The first step is to remove the excess water that’s sitting in the cover. The water is making it harder to remove the leaves and also putting a lot of stress on the cover. If that water were to freeze, the sharp frozen edges could damage the cover as well. Use a submersible cover pump to remove the water. Once the water is drained out, it’s time to remove the leaves. If there wasn’t much (or any water) and the leaves are dry, you can likely blow them off the cover with a strong leaf blower. Once you blow them off, you still need to rake them up, or they will blow back on. If the leaves are wet, you will need to push them from the center to the edges of the pool so you can get them out. Use a pool leaf brush that has nylon bristles so that you don’t damage the pool cover. Once the leaves are gathered by the edges scoop them up with a pool leaf rake. This is essentially a large slimmer net with a deep bag, which you can drag over the pool cover surface to gather the leaves. If you find that you hate this particular maintenance task, consider investing in a pool leaf catcher. This is a sturdy net that you install over the pool cover when you close down the pool. Now that all of the leaves have fallen, you pull the net off, gathering up all of the leaves as you go. It makes the task very quick and easy enough for one person to do alone. This entry was posted on Friday, January 25th, 2019 at 12:59 pm. Both comments and pings are currently closed.